and the little seed that could. 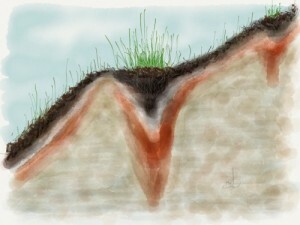 Plants and soil formation respond to subtle gradients on a slope. I had one class in graduate school that changed my perception of the world. Soil Science. It turned my world upside down, literally. Professor Martin Jurgensen, recently retired from teaching, but still conducting research, set the soil on fire. He did study the effects of fire on soil, but that isn’t what I mean. All my life, I had been focusing on what happens above the ground, when the real action is below. Dr. Jurgensen was able to bring the complexities of the soil to life in such a way that I would never see the world the same again. A forestry MS student at the time, I went on to get a PhD in Soil Science. In order to study the soil with any degree of real understanding, you need to consider its physics, chemistry, hydrology, biology, evolution, landscape position, and climate. That’s a lot. If you ever have a chance to speak with someone who works with the soil routinely, you will hear them touch on all these aspects, be they a scholar or a farmer. Soil is so complex, in fact, that there was a brilliant article about the tacit nature of reading landscapes and intuiting the soil beneath. How can something so complex be taught and passed on to the next generation of soil surveyors (B.Hudson 1992)? there’s probably quite a few unknowns, as well. Seeds wait in the soil, sometimes for a very long time for the right combination of conditions to form at their precise location, and be stable enough to ensure that the seedling will be able to put in roots before things get too crazy out there. Soils develop a ‘seed bank’ as seeds waiting for their turn are incorporated into the soil. Some seeds can live for decades. Seed balls are, in a fundamental sense, a synthetic soil. Not that they are made of synthetic materials, but that they are synthesised deliberately to create a buffered nurturing environment for the seed and seedling. When I make seed balls, I try to consider as many as the soil-seed and soil-seedling interactions as I can. My goal: provide an environment that is convincingly safe for germination, that will sustain for long enough for the seedling to emerge and become more resilient.